Check out Matt’s post on My Tracks and here is the link to find out more/download My Tracks for your Android phone! I’ve been wanting to toy around and learn the Android OS since I got my G1 phone a couple months ago. All the Google services work great on Android: GMail, Calendar, Maps, etc. However, Google has thus far fumbled on a decent “To Do” list. That’s why many people like myself are big users of rememberthemilk.com (aka “RTM”). I’m not the first person to wish for an RTM Android app. Their mobile site is okay, but a custom app is a must-have for something you use often. 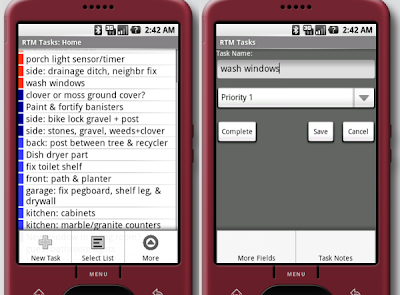 No one seemed to be delivering, so I made the “RTM Tasks” Android app myself (see below), leveraging the RTM API. Since I got my HTC Dream (Gphone) I have been lost without a synchronized task list. Fortunately, a man by the name of Steve V (Vinsac I think) took the initiative and created a great app that integrates with Remember the Milk (https://www.rememberthemilk.com) – a free and awesome online tool for task management. Just install Steve’s app called “RTM Tasks” from the Market on your gphone, provide it with RTM API access (it handles it for you) then you can interface with all of your tasks online. Very handy indeed.